If you invest or trade in shares or stocks, you know the importance of being up-to-date, especially when it comes to the price update of stocks that you have in your portfolio. There are hundreds of paid services which send you price updates daily of your selected stocks. But what it takes is a huge money and most of the time that is not worth to subscribe. When the internet is doing anything, you can easily set up the auto update of stock prices with FREE SMS directly on your mobile. You just have to make a setting once and you will get the stock price updates on predefined time via an sms on your mobile number and the most important thing about it is all this is FREE. Here I am sharing a Trick to get the End-of-Day data summary for any NSE and BSE script, you want on your mobile for FREE. 3. Little knowledge of Web, Google SMS Channels and Yahoo! Pipes. Money wise its totally free but it will cost your around half hour time. Log in to your Yahoo! Account and visit Yahoo!Pipes. After going to Pipes page, you will see the introduction screen. Click on “Clone” button near to red Star. It will clone that pipe in to your yahoo account. Locate the Default stock ticker text. You have to enter here the Yahoo! Finance symbol of a company that you want to go get the data. That you can do from this link. Copy and paste the Yahoo! Symbol for you company in this Default field. Then click on link Save a copy. This will save the pipe in your account. Now click on Back to my pipes link. It will give you a list of your saved pipes. Click on Get as RSS link. This will give you the RSS address of that pipe feed you just created. Now open a new browser tab and log in to Google SMS Channel account. You can go directly from here. After logging in to Google SMS Channel, you have to give your mobile number and then confirmation code has to be entered to activate the sms channels. After will that create a New SMS channel in to your account and make necessary settings as per your need. What you have to do is Select “RSS/Atom Feed “ as a source for this channel. 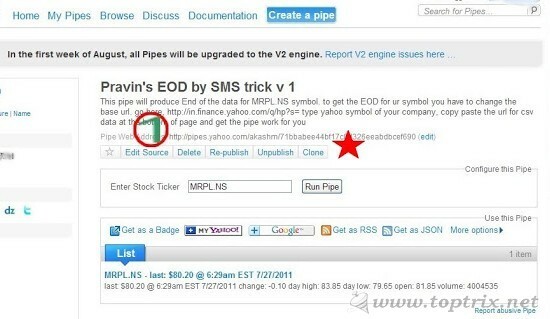 Copy paste the RSS address of your RSS Yahoo pipe here. Just have a preview of whether the channel is working correctly. This may give error at the first attempt but don't worry its Google problem. Clicking on Preview button 2-3 times will work. What's important here is you have to select both title and boy in Content option. This is the procedure for only one script. You have to repeat the same Yahoo! Pipes and Google channel procedure for each script. Create as many as Pipes and SMS Channels you require. Its really working superb. keep up. You do not have to set time at the pipe level. You have to set the number of times the Google SMS channel get updated and should fetch the RSS channel you created. You can either set the number of times you should get the update in day or the extact time when you want to get the update sms. Set it as you want and the SMS channel will fetch for the content and sent you the updated stock price. Great Work. but Sms channel has been stopped. Can you please update this. SMS channel has been stopped. Can you please update this? Google SMS Channel account. link is down in your above post. your short google url link is down.